"Lemon adds to the flavor of this easy recipe." Preheat oven to 425 degrees F (220 degrees C). Press 1 pie pastry into bottom of a 9-inch pie pan. Mix blackberries, sugar, flour, and lemon juice together in a large bowl. Pour into prepared crust. 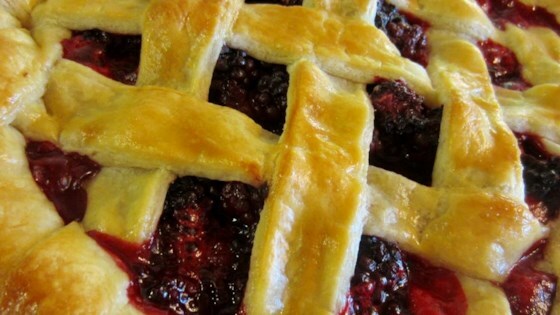 Slice second pie crust into 1-inch strips; weave a lattice pattern over the top of the pie. Seal the lattice ends to the bottom pastry with a dab of water; crimp edges together. Brush lattice top with beaten egg. Bake pie in the preheated oven for 15 minutes. Reduce heat to 375 degrees F (190 degrees C) and bake for an additional 15 minutes. Loosely cover pie with aluminum foil to prevent burning; bake until pie is bubbling, 10 to 15 more minutes. YUMMY pie! I used ready-to-go shortcrust pastry out of the freezer, and after reading the other reviews I used 1/2 cup of flour (not 3 Tbs). Turned out great, family love it! Turned out great! Family loved it. I look forward to making it again. super easy to make, my 1st pie ever and amazingly yummy!! I made this recipe. Excellent.